The Oppo R5 is the first device we meet that has Qualcomm's latest mid-range chipset - the Snapdragon 615 - under its hood. The Snapdragon 615 is built around a 64-bit octa-core Cortex-A53 main processor (4x 1.7GHz plus 4x 1.0GHz cores),an Adreno 405 graphics accelerator and 2GB of RAM. 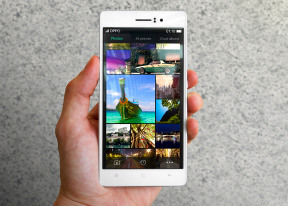 Oppo R5 features a 1080p display, which isn't the best choice of resolution for a mid-range chip, but we are sure the Adreno 405 will have no issues with that resolution. Our first benchmark test is GeekBench 3, which gauges the overall processor performance. Even with eight cores inside, the Cortex-A53 isn't among the most powerful CPUs around, so we didn't have our expectations sky high. Surprisingly, the Oppo R5 did great, beating the Snapdragon 801-powered HTC One (M8) and Oppo N3. The AnTuTu 5 is again a compound benchmark, which also takes in consideration GPU and memory performance. The Oppo R5 posted a good score, but it's hardly a winner when compared to other smartphones in its price range. Next comes the compound BaseMark OS II 1.0 benchmark. It tests the processor, memory, graphics, web and OS performance. The Oppo R5 did OK here, better than the octa-core Gionee Elife S5.1, but not as good as its high-end buddies. The multi-core and single-core performance of the Cortex-A53 processor in the Oppo R5 turned out weaker than the previous generation of Cortex-A7 cores. The multi-core score is equal to that by the quad-core Snapdragon 801 chip. Now, let's check the graphics department. The Oppo R5 uses a new generation Adreno 405 GPU, which supports OpenGL ES 3.0. The 1080p offscreen fps output of the Gionee Elife S5.1 is very good, managing half the framerate of the high-end Adreno 330, and much better than the previous generation Adreno 305 (like the one used within the Samsung Galaxy Grand 2, for instance). The 1080p onscreen result is rather good too, though we'd guess this chipset is better suited to 720p displays. Again, the Adreno 405 GPU outputs did half the framerate that flagship smartphones manage. The Basemark X benchmark draws pretty much the same picture as the GFX benchmark. The Oppo R5 did well in both web benchmarks, though there are faster phones out there. The Snapdragon 615 chipset is a notable upgrade over the previous generation. Its octa-core processor in snappy and it's certainly future-proof with its 64-bit architecture. At times, it was neck and neck wih the Snapdragon 801, which is quite an achievement on its own. The Adreno 405 is noticeably better than the Adreno 305 and the Mali-450 GPU, but fails to catch up with the Adreno 330 used in higher-end chipsets.